Donnelly Centre researchers have uncovered a genetic network linked to autism. The findings, described in the journal Molecular Cell, will facilitate developing new therapies for this common neurological disorder. As part of a collaborative research program focusing on autism led by Benjamin Blencowe, a professor in the University of Toronto’s Donnelly Centre for Cellular and Biomolecular Research, postdoctoral fellow Thomas Gonatopoulos-Pournatzis, lead author of the study, uncovered a network of more than 200 genes involved in controlling alternative splicing events that are often disrupted in autism spectrum disorder (ASD). Alternative splicing is a process that functionally diversifies protein molecules—cells’ building blocks—in the brain and other parts of the body. Blencowe’s laboratory previously showed that disruption of this process is closely linked to altered brain wiring and behaviour found in autism. “Our study has revealed a mechanism underlying the splicing of very short coding segments found in genes with genetic links to autism,” says Blencowe, who is also a professor in the Department of Molecular Genetics and holds the Banbury Chair of Medical Research at U of T.
“This new knowledge is providing insight into possible ways of targeting this mechanism for therapeutic applications”. Best known for its effects on social behaviour, autism is thought to be caused by mishaps in brain wiring laid down during embryo development. Hundreds of genes have been linked to autism, making its genetic basis difficult to untangle. Alternative splicing of small gene fragments, or microexons, has emerged as a rare, unifying concept in the molecular basis of autism after Blencowe’s team previously discovered that microexons are disrupted in a large proportion of autistic patients. As tiny protein-coding gene segments, microexons impact the ability of proteins to interact with each other during the formation of neural circuits. Microexons are especially critical in the brain, where they are included into the RNA template for protein synthesis during the splicing process. Splicing enables the utilization of different combinations of protein-coding segments, or exons, as a way of boosting the functional repertoires of protein variants in cells. And while scientists have a good grasp of how exons, which are about 150 DNA letters long, are spliced, it remained unclear how the much-smaller microexons— a mere 3-27 DNA letters long—are utilized in nerve cells. “The small size of microexons’ presents a challenge for the splicing machinery and it has been a puzzle for many years how these tiny exons are recognized and spliced,” says Blencowe. To answer this question, Gonatopoulos-Pournatzis developed a method for identifying genes that are involved in microexon splicing. Using the powerful gene editing tool CRISPR, and working with Mingkun Wu and Ulrich Braunschweig in the Blencowe lab as well as with Jason Moffat’s lab in the Donnelly Centre, Gonatopoulos-Pournatzis removed from cultured brain cells each of the 20,000 genes in the genome to find out which ones are required for microexon splicing. 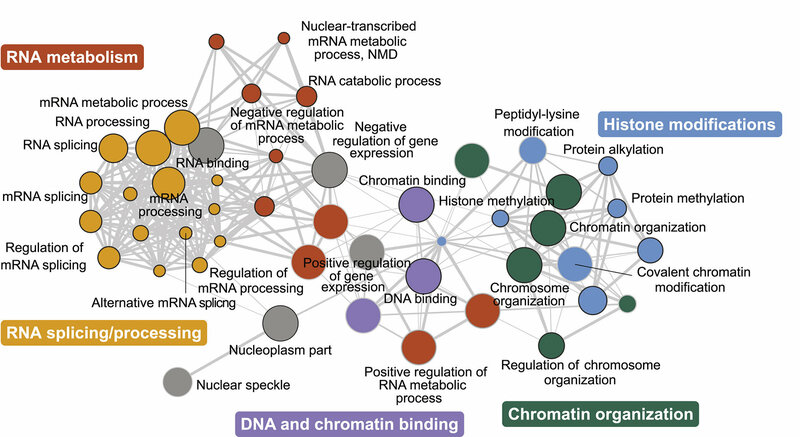 He identified 233 genes whose diverse roles suggest that microexons are regulated by a wide network of cellular components. “A really important advantage of this screen is that we’ve been able to capture genes that affect microexon splicing both directly and indirectly and learn how various molecular pathways impinge on this process,” says Blencowe. Furthermore, Gonatopoulos-Pournatzis was able to find other factors that work closely with a previously identified master regulator of microexon splicing, a protein called nSR100/SRRM4, discovered previously in the Blencowe lab. Working with Anne-Claude Gingras’ team at Sinai Health System’s Lunenfeld-Tanenbaum Research Institute, they identified proteins called Srsf11 and Rnps1 as forming a molecular complex with nSR100. Knowing the precise molecular mechanisms of microexon splicing will help guide future efforts to develop potential therapeutics for autism and other disorders. For example, because the splicing of microexons is disrupted in autism, researchers could look for drugs capable of restoring their levels to those seen in unaffected individuals.